Oxygen is an important element in the body that usually obtained through spontaneous respiration. The air we breathe is approximately 21% oxygen. It is usually enough to support* important major functions in the body like energy production, immune function, metabolism, and nutrient transport. However, with the current pollution in our environment, the percentage and quality of oxygen are significantly reduced*. It is a fact that without oxygen, people is not capable of survival. Decreased* levels of oxygen in the blood also leads to various illness not only on a cellular level but can also impose fatal consequences for the major organs in the body especially to the heart and the lungs. With these notes, NutriO2 provides* its benefits by ensuring* that important biological mechanisms are supported by supplying the body with a high concentration of bio-available stabilized form of oxygen. 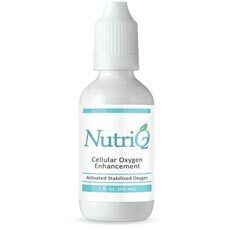 The activated form of oxygen in NutriO2 ensures that the body is equipped with a pure and ample amount of oxygen in order to support* important body functions. Since the product is mixed with water and taken orally, the absorption of oxygen happens in the digestive system and is made bio-available for the body. Bio-available oxygen – This form of oxygen is readily available to be absorbed and utilized by the body. It does need to be circuited back to the lungs to be absorbed in the blood since the oxygen is already dissolved in water which is consumed orally and is to be absorbed in the digestive tract. Distilled water – This is basically water that has undergone the process of distillation to remove* any impurities. Sodium chloride – It is an essential compound that is needed to maintain fluid balance in the body. It also supports* essential body functions. Essential and trace elements – These are minute elements which are vital to certain body mechanisms. The product is stable and non-toxic. It comes in liquid form thus making it easier for oral consumption. It is pH balanced and contains no chlorite molecules. It supports* metabolism and enhances* a person’s immune system. It enhances* metabolism and it helps increases* a person’s energy level. It supports* metabolism, immune function, and nutrient transport. It helps improve* energy level in the body. It might help reduce* signs of aging and may also promote weight loss*. This product should not be taken with food or mixed with any liquid other than water. Interaction of NutriO2 with food particles can significantly reduce* its potency. Do not use metallic utensils when mixing NutriO2 because the oxygen component may react with the metal and cause degradation of the oxygen in the supplement. Do not give this product to sick newborns since it might cause oxygen toxicity. The manufacturer mentioned that since the product basically contains oxygen and water, the product has no noted side effects. Mix 15 drops of NutriO2 in 8 ounces of water. It is to be taken 30 minutes before or 1 hour after a meal. Take one serving three times daily. According to the manufacturer, all people can take NutriO2 since it basically contains oxygen which is an important element needed by the body. However, this supplement should not be given to sick newborns since it can cause oxygen toxicity. Is NutriO2 effective for weight loss*? NutriO2 is not actually marketed as a weight loss* supplement. It is a holistic wellness approach and weight loss* is one of its many possible benefits. However, taking NutriO2 alone without proper diet and regular exercise will definitely not result in weight loss*. NutriO2 can be a good supplement to consider especially of you want to improve* the levels of oxygen in your body. As mentioned before, oxygen supports* many body functions and is vital to a person’s survival. This supplement provides* a more holistic approach to health and wellness since it supplies the body with a bio-available oxygen which can be easily utilized by the body. The most effective health supplements that are currently present on the market can be found below. We have taken our time and rated these products in accordance to these five essential factors: quality of active ingredients, energy boosting, hormone balance restoration, cognitive function improvement and immune system strengthening. In the United States, the concept of using cobra venom as a natural pain remedy and analgesic was adopted in 1936 when a researcher by the name of Macht from the pharmaceutical company Hynson, Wescott and Dunning initiated several preclinical and clinical investigations. In his investigations, Macht was able to prove that the analgesic (pain relieving) effects of cobra venom when injected in minute doses were far superior to the effects of morphine. In his trial, patients who were no longer responsive to the opiate morphine were given cobra venom as a natural pain remedy. The venom was 70% effective and gave a long lasting effect for the natural pain management of headaches and arthritis as well as other chronic conditions without the possibility of addiction. Homeopathic medicine which included cobra venom was included in the Food Drug and Cosmetic Act (FDA) in 1938. Currently, cobra venom is being studied for the natural treatment of various forms of chronic pain and other disorders. I can almost guarantee it's lurking in your medicine cabinet at this very moment. And I'd bet my life that this killer is in the home of someone you care about. It's responsible for at least 56,000 ER visits every year, 26,000 hospitalizations, and hundreds of deaths. Yet when we think about it... if we ever do... its reputation for being "gentle enough for babies" makes it easy to dismiss any threat to our life. But the reality is, you--or someone you love--could be just a couple of pills away from severe liver damage or even death. And, unfortunately, I'm not being at all dramatic. In fact, even those do-nothings over at the FDA have admitted this is true...for all the good it's done us (more on that in a minute). The killer is acetaminophen, and I've been warning my readers and patients about its dangers for many years. Acetaminophen is an "everything AND the kitchen sink" drug. Big Pharma likes to toss it into their most popular combo products like it's some sort of added value bonus gift. You'll find it hiding in plain sight in Alka Seltzer Plus, Excedrin, Robitussin, Dayquil, Dimetapp, Benadryl, Midol, Nyquil, and - of course – Tylenol--to name just a few. And with it in literally hundreds of common over-the-counter drugs, as well as prescription meds like Percocet and Oxycodone, it's easy to see how treating a backache and a case of the sniffles in the same day could suddenly add up to toxic levels. This is not a new problem. We've known for years that too much acetaminophen can lead to tragedy. Back in 2011--years after some of us had been sounding the alarm--some suit at the FDA finally fired up his keyboard and dashed off one of the agency's infamous "statements." In it, the feds admitted that overdoses of the drug are a leading cause of liver failure. And that's pretty much all they did. The agency did nothing concrete to help prevent accidental overdoses. They simply requested that manufacturers (pretty please) consider reducing the amount of acetaminophen in their prescription products to 325 mg or less. And, as you can probably guess, nearly half of those manufacturers simply ignored the toothless recommendation. Are you one pill away from death? In the years since that request, we've seen thousands of people succumb to acetaminophen-linked liver failure, and hundreds more die. In fact, it's by far THE most common cause of liver failure in this country. And now, three years later, the FDA has issued yet another statement on the drug, because, you know, that worked so well before. This time around they're targeting doctors and pharmacists. They've asked docs to consider only prescribing combo drug products that contain no more than 325 mg of acetaminophen. And what if that doesn't work? Don't worry; the FDA's got a backup plan for that, too. They've asked pharmacists to call prescribing doctors if they happen to notice that a patient is getting over 325 mg of the drug. Setting aside the laughable idea that a pharmacist could actually just make a call and get right through to your doctor, this backup plan is still full of more holes than a block of your finest Swiss cheese. I don't know about you, but the last time a pharmacist actually took the time to go over even basic prescribing information with me was probably during Bush Senior's administration. Counting on them to do the math on this for us is just foolhardy. Even worse, your pharmacist will have no idea what over-the-counter products you're taking. So even if he's doing a bang up job, and does make that phone call to your doctor, you may still be just a pill or two away from an accidental overdose, acute liver failure or even death. And if you're wondering what the feds are doing about the over-the-counter medications that contain high doses of acetaminophen, well I can tell you in two words: 1. Absolutely 2. Nothing. The FDA freely admits there isn't a shred of evidence that acetaminophen in doses greater than 325 mg provide any benefits that could possibly outweigh the risk of liver damage, yet they're not doing a thing to curb the excessive amounts found in many over-the-counter meds. In fact, you can purchase products containing far more than 325 mg of this potential killer in any grocery or drug store. For example, a single caplet of Tylenol Complete Cold, Cough & Flu Nighttime contains a staggering 500 mg of acetaminophen! But that's okay, because I have a foolproof plan of my own. There's actually just one step. Open your medicine cabinet and grab every single last one of the acetaminophen-laced drugs you find and toss them into the trash can. There are much better and safer choices for pain relief anyway.